Any unfolding experience can be quantified and re-experienced in a new aesthetic way. Occurrent Arts got the opportunity to spend the Summer of 2012 working with Wildlife to take the Google Fiber Campaign and re-imagine it in a new visual, sonic, and tactile manner in Google’s Fiberspace in Kansas City. The Google Fiber Campaign is the means by which Google is providing their new ultra-high-speed internet to users. A certain number of users within a given area are required to sign up for the service before Fiber can be provided to that area. We took the sign-ups and corresponding progress for each of those areas during Google Fiber’s release in Kansas City and sought to represent them in a two part interactive experience. We opted to outline the different neighborhoods with digital “strings” which would be plucked whenever a user signed up within a region, creating a visualization and sonification of the unfolding campaign within the Google Fiberspace. We also created an android application which you could use to navigate the dulcimer map. By sliding your fingers over the fiberhood on the map you could strum the strings on the map; to ring out the current state of the campaign to the room. 90% of the Fiberhoods reached their signup goals, the campaign was a success! 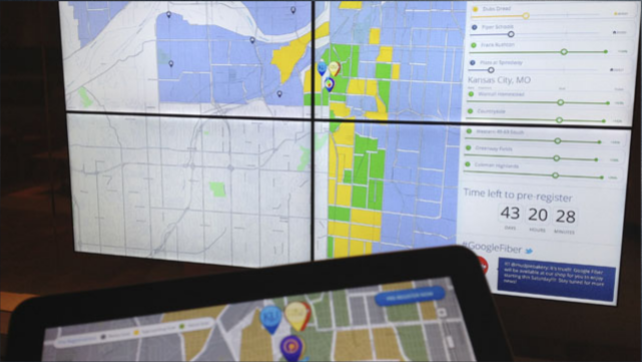 As a result Google’s Fiberspace continues to house our installation which nows displays the unfolding construction progress of Google Fiber across Kansas City.